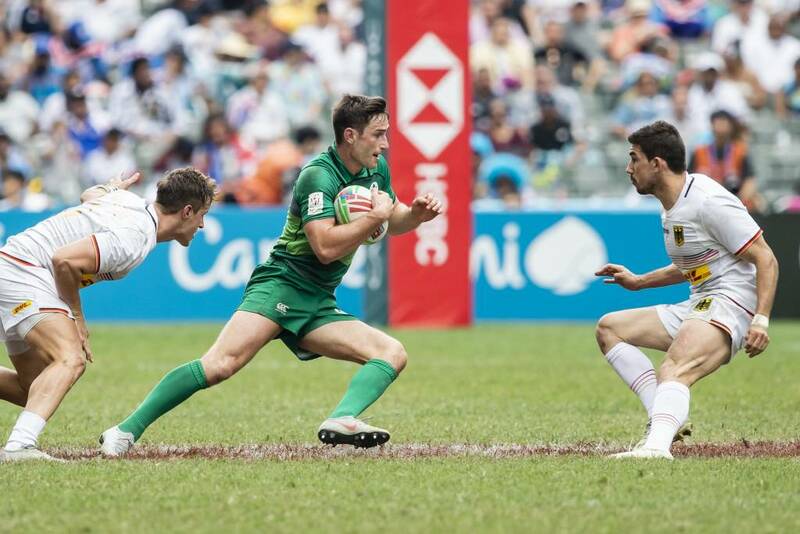 The Ireland Men’s Sevens team will be one of the 15 core sides on next season’s HSBC World Rugby Sevens Series after overcoming hosts Hong Kong 28-7 in today’s qualifier final, having see off Germany 19-10 in a tense semi-final. In front of a partisan capacity crowd at Hong Kong Stadium, Anthony Eddy’s men put last year’s heartbreaking semi-final exit to Japan behind them with an assured performance across the tournament’s three days, posting five wins and a draw and scoring 27 tries to emerge as deserving champions. 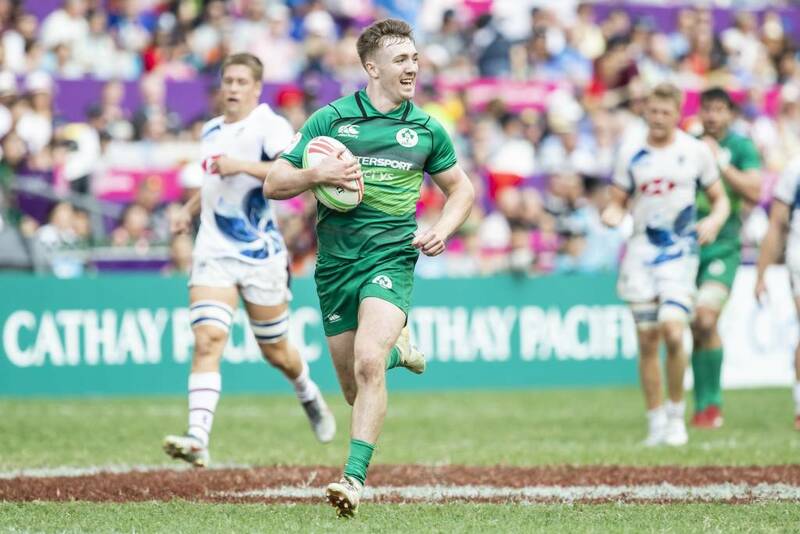 The emotion bubbled over for Harry McNulty, one of the ‘originals’ from the initial 2015 Ireland Sevens squad. His tears after the final whistle against Hong Kong showed how much it meant to the players to reach the highest stage of the game on a four-year journey that has had many ups and downs. Fittingly, it was talismanic forward McNulty who dived over for the final’s opening try in the third minute after an initial Billy Dardis turnover and a deft offload off the ground from Jordan Conroy. Captain Dardis, who had missed day one on Friday due to a stomach bug, converted to give Ireland an early seven-point lead. Shannon’s Greg O’Shea, whose grandfather emigrated to Limerick from Hong Kong in the early 1950s, was next to dot down, outmuscling the covering defender on an arcing last-minute run to stretch out for the whitewash. Dardis again converted to give Eddy’s charges a 14-0 buffer at the break. The jet-heeled Conroy crossed for his 10th try of the weekend at the start of the second half, profiting from Foster Horan’s ball-dislodging driven tackle as the loose possession allowed Conroy to break clear from near halfway. The Tullamore speedster was later announced as the Player of the Tournament thanks to his impressive tally across the six games. Dardis converted from straight in front and also added the extras to Terry Kennedy’s closing try, which came in response to Tom McQueen’s seven-pointer during O’Shea’s sin-binning. Determined to have the final say, Ireland worked the ball wide for Adam Leavy to charge up the right wing and pass back inside for the trailing Kennedy to race clear and go in behind the posts. We had a go last year, we didn’t quite make it. We just missed out. The boys have worked really hard for the last twelve months and I think they thoroughly deserved their victory and a spot on the World Series. They played well yesterday and played pretty well today as well. Earlier in the day, with high humidity at pitch level, Ireland met European rivals Germany at the semi-final stage. The Germans were Hong Kong runners-up for the last two years and both teams went hard at it during the opening exchanges. It took until the closing seconds of the first half for Ireland to go ahead. Germany conceded a penalty deep in their own 22, losing Claude Brechenmacher to the sin-bin for a deliberate knock-on as Kennedy attempted to link with Conroy. Ireland immediately capitalised as a well-worked cross-pitch move ended with Conroy crossing in the left corner for the first of his two tries, making it 5-0 at the interval. The momentum swung in Germany’s favour, a tap penalty helping to propel Tim Biniak over the line in the eighth minute. A second unconverted score followed two minutes later as turnover ball led to Tim Lichtenberg touching down to make it 10-5. The Germans were winning the breakdown battle and Ireland breathed a big sigh of relief when Fabian Heimpel drop-kicked a penalty wide. From the dropout, McNulty tapped back to Conroy as Ireland got back on the front foot, working the ball upfield. They used a penalty advantage as O’Shea swerved out to the right, lofting a pass over the top for Kennedy to dash up to the 22 and pass back inside for the supporting Dardis to finish off to the right of the posts. The Naas man brilliantly converted to edge Ireland ahead with just over a minute remaining, and Conroy sealed their passage through to the decider with a very well-taken try in the right corner despite two covering defenders. Credit to McNulty’s hard graft to gather the restart and Kennedy’s quick pass to release the Buccaneers winger. Dardis tagged on another expertly-struck conversion. 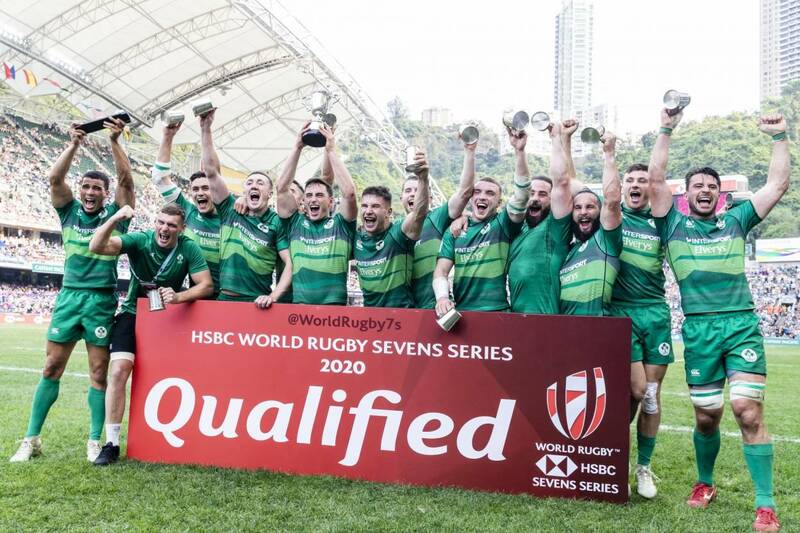 Ireland’s unbeaten run over the three days in Hong Kong means the IRFU Sevens Programme is set to have two teams on the World Series circuit next season – both the Women and Men. Dardis and his team-mates will return to the World Series stage in May and June as an invitational team, competing in London, where they made history with a bronze medal finish last year, and also Paris. As well as the defence of their European Sevens title this summer, they also have the Rugby Europe qualifying tournament for the 2020 Olympics in Colomiers, France on July 13-14. The winners of that will advance to the Olympics in Tokyo, with the next two sides booking places at the global Olympic Repechage qualifier in 2020. Dubai, Cape Town, New Zealand, Sydney, Hong Kong and Paris will host combined Men’s and Women’s World Sevens tournaments from next season onwards as part of the next four-year World Series hosting cycle. Team: John O’Donnell, Harry McNulty, Foster Horan, Jordan Conroy, Hugo Keenan, Terry Kennedy, Mark Roche. Subs used: Adam Leavy, Ian Fitzpatrick, Greg O’Shea, Bryan Mollen. Not used: Billy Dardis (capt). Team: Harry McNulty, Foster Horan, Ian Fitzpatrick, Billy Dardis (capt), Jordan Conroy, Hugo Keenan, Terry Kennedy. Subs used: Adam Leavy, Mark Roche, Greg O’Shea. Not used: John O’Donnell, Bryan Mollen. Team: Harry McNulty, Foster Horan, Ian Fitzpatrick, Billy Dardis (capt), Jordan Conroy, Terry Kennedy, Greg O’Shea. Subs used: Adam Leavy, Mark Roche, Bryan Mollen. Not used: John O’Donnell, Hugo Keenan. Subs used: Adam Leavy, Bryan Mollen. Not used: Mark Roche, John O’Donnell, Hugo Keenan.